VINTAGE COSTUME ANTIQUE ESTATE JEWELRY BRACELETS! 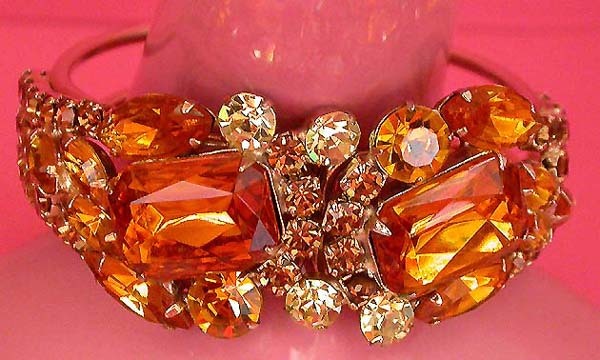 Juliana Amber Crystal Rhinestone Clamper Vintage Antique Estate Bracelet For Weddings, Proms, Pageants And Parties! 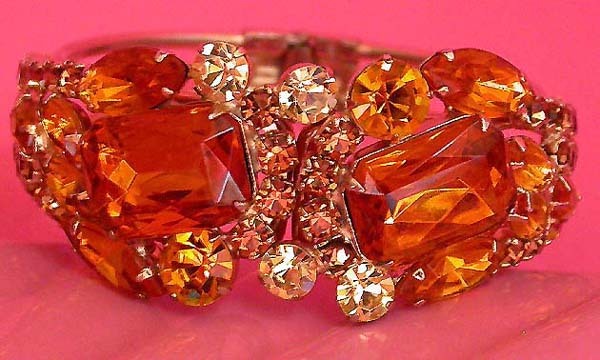 Item #BR16852 - Juliana Amber Crystal Rhinestone Clamper Vintage Antique Estate Bracelet. Size: Inside opening diameter is 2 1/4". Designer: UNSIGNED JULIANA CLAMPER BRACELET. Juliana's jewelry is highly collectible and sought after. It is not signed but is distinguishable and recognisable. 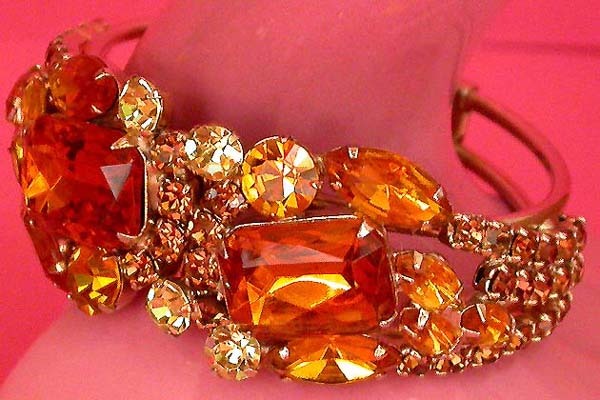 This breathtakingly beautiful Juliana clamper bracelet is glamorous to the hilt! Half of the bracelet is covered with loads of gems. The two colossal amber colored emerald cut crystal rhinestones are the center focus. They sparkle so vibrantly that cannot be ignored. Framing these two gorgeous, huge stones are glittering amber and citrine rounds and marquises of various sizes and shades. The huge amber stones measure 1/2" x 6/8" each. The layer of sparkling gems is tiered onto the front half of the bracelet creating a 1/2" thickness. All the stones are prong set on gold tone. Absolutely a show-stopper. The bracelet opens in the front. Excellent condition. A fabulous bracelet to wear at weddings, prom nights, pageants, parties, cruises and special functions! US$188.00. SOLD.